Forested pork is one of the many animals we raise here on the farm. It is always nice to fill the freezer with food that was raised humanely and naturally. Aside from the fabulous meat, we also get a fair amount of pork fat. I love pork fat because I can use it to render lard. Yes, lard! Lard from forested or pastured pork is actually quite good for you and can be used to make pie crusts and biscuits. If you have not baked with freshly rendered lard then you are missing out. What I use lard for most of the time, however, is on my clothbound cheddar cheeses. When I am ready to place a wheel of cheese into the cave for aging, I wrap it with cheese cloth and then rub it down with the lard. 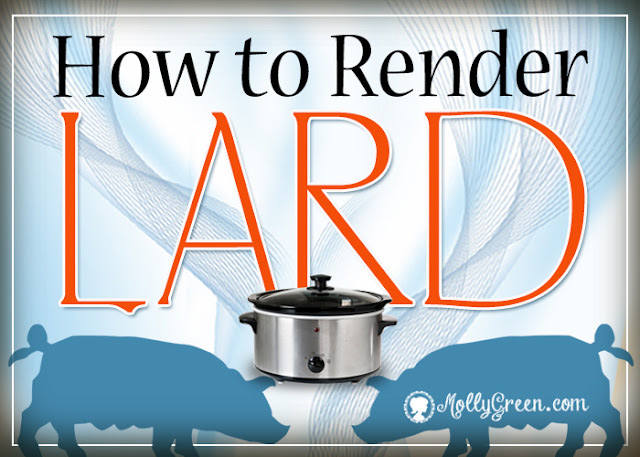 Rendering lard is quite simple and I am happy to share with all of you an article I wrote that has been featured in Molly Green. Please check it out and share it with anyone who has ever wanted to render lard. You can also share it on Pinterest and you can find Molly Green Magazine on Facebook! You will not only find my article, but lots of great articles and resources for Home steading, Homemaking and Homeschooling! What are your favorite recipes using lard?